How do my students take 2018-2019 Math League Contests online? How much does it cost to take 2018-2019 Math League Contests online? What are the 2018-2019 Math League Contests Online dates? For paper and pencil contests, all students need to take the contest at the same time or their scores would not be counted. Is this also true with the online test? Or can they take it throughout the day whenever their class meets? Before the contest date, what should I do? On the contest date, how do students take the online contest and how do teachers proctor the online contest? When and how can I get the online contests scores of my students? We have several testing sessions for the upcoming Math League Contest. Does the teacher activate a new code for each testing session? Is there a sample online contest? I have enrolled my students in my class. Are they automatically registered for the online contest? I mistakenly assigned one boy to take the 4th grades contest but he is actually in the 5th grade. Can I change him to take the 5th grade contest? I have registered my students to take contest online. Now I want to add a new student. How should I do it? I'm scheduled for the 6th, 7th and 8th grade contests. Must all grades take the contest at the same time or on the same day? Must all my students take the contest at the same time? We have some advanced 5th graders whom we believe are ready for the grade 6 contest. Will there be any problem if they take the grade 6 contest both this year and next? Which contests are multiple choice questions and which require a student-generated response using the "strict rules"? Are the online tests the same as the pencil and paper tests? Can some students take the online test and others take the hard copy version? And how the scores are entered into your system? I am a parent. The school of my child is not participating in Math League Contests this year. Can individual students take Math League Contests? What are the benefits of taking Math League Contests online? Since 2011-2012 school year, students have been taking Math League Contests online using the computers or iPads in their schools. This online testing is available at no cost to your school if your school is registered for any Math League Contests for grades 4, 5, 6, 7, 8, Algebra Course 1, and High School. If your school is not already registered for these contests, you may register your school now at www.mathleague.com. You choose the date to administer each contest—you may choose a different date for different contests. The process is very simple. Teachers log in to our Math League Adaptive Learning System, https://online.mathleague.com, go to the "Take 2018-2019 Contests Online" page, and choose the contest date for each contest. On the contest date, students log in to the Math League Adaptive Learning System and complete the contests. We mark the contests and keep scores of all your students for you. This online testing is available at no cost to your school if your school is registered for any Math League Contest for grades 4, 5, 6, 7, 8, Algebra Course 1, and High School. You may have as many students as you want to take the contests online. If your school is not already registered for these contests, you may register your school now at www.mathleague.com. High school students can take their contests online from Oct, 2018 to March, 2019. Students of Grades 6, 7, and 8 can take their contests online on any date from 02/18/2019 to 03/01/2019. Students of Grades 4, 5, and Algebra Course 1 can take their contests online on any date from 04/15/2019 to 05/19/2019. Note: All the students of the same grade in one school need to take their online contest on the same day, but across different sessions if necessary. Students of different grades can take their online contests on different dates. Since the Online Contests require the use of computers or iPads, we realize that many schools may not have enough equipment to administer the contests to all students at the same time. For schools that are testing online, we do allow the contests to be administered throughout the school day rather than at one seating. Please make sure you have registered your students from your class to take the contest online. Some teachers made the mistake of thinking that students enrolled in their classes were then automatically registered for the online contest, which is not the case. Please encourage your students to take a sample online contest before the contest date so they will be familiar with the process on the contest date. After your students log in to the system, they can click on the "Sample Online Contests" button under "My Home" page to take a sample contest. For high school students, we impose some strict rules to enter answers during online test. Please encourage your students to review the instructions to enter answers before the contest date at https://online.mathleague.com/rules.php. For all other grades, it is multi-choice questions. Once students start online contest, the clock keeps counting down. So it is very important that you need to make sure that during the contest the network will stay connected and the computers will be working properly. We thus suggest you keep handy pencils and papers during the contests, in case your students have problems completing the contests online. Your students can then write down their answers and you can send the answers to us by email. We will enter the answers and scores in the system for you. Log in to https://online.mathleague.com, and go to "Take 2018-2019 Contests Online". Click on "Initiate Test Day" to go to online contest page. Click button "Generate Activation Code" to generate the activation code no earlier than 5 minutes before starting the contest. When it is time to start the contest, please distribute the activation code to your students so they can start the contest. The activation code generated by the system is valid for 15 minutes. 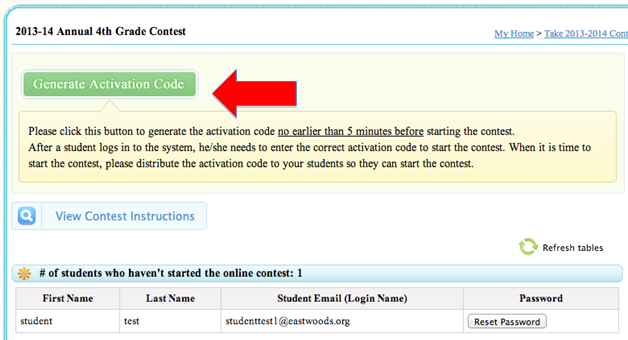 After expiration, you can click the button again to generate a new activation code if you need for example in case one of your students arrives late. During the online contest, if the computer a student is working on experiences some problem, the student can log in to another computer and resume his/her contest. Log in to the https://online.mathleague.com before the contest starts. Enter the activation code given to you by your teacher to start the contest. After students finish their contests, they will know their scores immediately. Online contests scores are available to download for teachers the day after your students take the online contests. Teachers log in to Math League Adaptive Learning System, https://online.mathleague.com, go to the "Take 2018-2019 Contests Online" page, and click on the "Review/Download Scores" button to download the scores. Question: Can some students take the online test and others take the hard copy version? And how the scores are entered into your system? Yes. Log in to https://online.mathleague.com. Go to "Take 2018-2019 Contests Online" and click on the "Sample Online Contests" button. No. You need to register your students from your class to take the online contest. Some teachers made the mistake of thinking that students enrolled in their classes were then automatically registered for the online contest, which is not the case. I mistakenly assigned one student to take the 4th grades contest but he is actually in the 5th grade. Can I change him to take the 5th grade contest? Yes. You can change him to take the 5th grade contest any time before the contest starts, including on the contest date. You need to first enroll this new student in your class, if he is not in any of your classes now. Then you need to register this student to take the contest online. With the Online Contest, we've loosened the rule about all the students taking the contest at the same time as with paper contest. Students of different grades can take their online contests on different dates. All the students of the same grade in one school need to take their online contest on the same day, but across different sessions if necessary. For example, if you have 120 students of grade 6, 45 students of grade 7, and 55 students of grade 8, then it is possible you arrange the contest dates this way. The 120 students of grade 6 can take their online contests on Feb 22, 2012, across 4 different sessions. The 45 students of grade 7 and 55 students of grade 8 can take their online contests on Feb 24, 2012. With the Online Contest, all the scores of all your students will be official. It is no longer the case as with paper contest that if you give the 6th grade contest at several different times and on several different days, only the scores of the students who were present for the first testing session may be reported to Math League. In summary, if you use the Online Contest, you may administer the contests all day long and all of your scores will be official. You may also have as many students as you want to take the contests at no additional charge once your school is registered for any Math League Contest for grades 4, 5, 6, 7, 8, Algebra Course 1, and High School. Your younger students in 5th grade may take the 6th grade contest this year and again next year. A history of each student's past contest performances and scores, including details of every question the student answered correctly, will be available online, so students, parents, and teachers can track progress over time. Which contests are multiple choice quesitons and which require a student-generated response using the "strict rules"? High School Contests require a student-generated response using the "strict rules". And all other contests, including 4th, 5th, 6th, 7th, 8th, and Algebra Course 1, are multiple choice questions. The online tests are exactly the same as the pencil and paper tests. We will enter the scores of all your students who successfully completed their online contests into our system. You don't need to enter them at Score Report Center as you did before. If some of your students were not able to complete the online contests due to various reasons, but took the pencil and paper contests instead, please enter the names and scores of your 5 top-scoring students who took the pencil and paper contests at Score Report Center (optionally, you may enter more than 5 names, if you wish). I am a parent. The school of my child is not participating in Math League Contests this year. Can individual students take Math Contests? We only allow participation by schools. If you are a parent, perhaps you could download a sample contest and make an appointment to see the principal. Principals often are cooperative with parents who make a request to participate if you show them the quality of the materials by bringing a sample contest with you. Sample contests can be downloaded from Math League Web site, www.mathleague.com. Choose your own contest dates. Note: All the students of the same grade in one school need to take their online contest on the same day, but across different sessions if necessary.Students of different grades can take their online contests on different dates. We keep a history of each student's contest scores. A history of each student's past contest performances and scores, including details of every question the student answered correctly, are always available online, so students, parents, and teachers can track progress over time. Before the contest date, students can use the Math League Adaptive Learning System to prepare for the contest. The cost for a school to use the Math League Adaptive Learning System is $9.95 per contest grade level.